Kuching, Sarawak's capital, is one of the most liveable and people-friendly cities in the region. 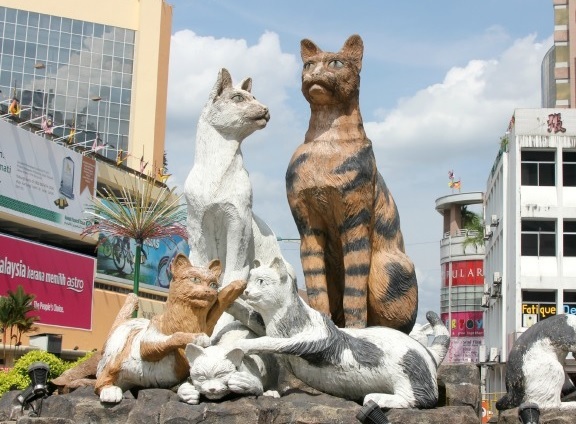 Kuching, its name means cat in Malaysian, has all the modern amenities without losing its old world charm. The narrow, bustling streets near the river are crammed with ornate temples, markets, historic buildings and traditional Chinese shop houses selling local handicrafts. Nearby is the Sarawak Museum with its beautiful gardens and the park built round the old town reservoir. 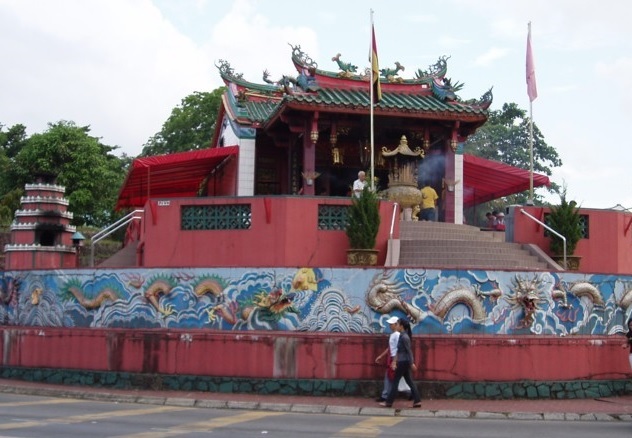 Kuching also lays claim to nine museums, many within walking distance of each other. Kuching is a riverside city. Its location on the Sarawak River was chosen not only for its strategic and commercial importance, but also for its enchanting natural beauty. In days gone by the river was the city's main highway. The river still retains its importance and picturesque charm in the modern era. Present day life is still concentrated on the waterfront. Adjacent to the Waterfront is the Main Bazaar, the oldest street in the city and the heart of old Kuching. It has some superb examples of Chinese shophouse architecture, many of which have been occupied by the same family for generations. These families still pursue traditional occupations such as tin-smithing, carpentry and petty trading. Kuching�s highest concentration of antique and handicraft shops are to be found here, and shoppers can rest between bargaining sessions in a number of old-fashioned coffee shops with panelled walls and marble-topped tables. Jalan Carpenter, which is parallel to Main Bazaar, has a similar selection of small traders and coffee shops, as well as food stalls and two small Chinese temples. If you want to go to a modern shopping center, you can go to The Spring, the Riverside Shopping Complex, or the Boulevard Shopping Mall. 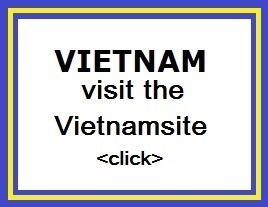 See the separate webpage. The Kai Joo Lane night market have been in the pipes for around a year but shelved due to the unfavourable conditions during the dusty months of construction at adjacent India Street Pedestrian Mall. But these days are over now, the neighbours are literally throwing a street party. The colourful Sunday Market is where household items, souvenir items and exotic jungle produce are sold in various forms. The Market was started in 1980 by the Kuching Municipal Council to allow unlicensed hawkers to sell numerous consumable items like fish, meat, clothing, flowers and jungle produces of various kinds. 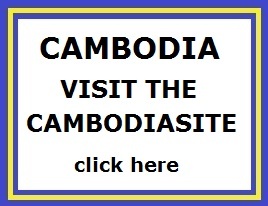 The Sunday Market has become so popular over the years that one looks forward to it. One of the highlights of Kuching is a visit to one of the few ceramic factories just outside town. Sarawak is famous for its unusually decorated earthenware vases of all shapes and sizes. Kuching pottery incorporates the ancient Dayak designs with a blend of modern colour and technique. Small vases with traditional designs make good souvenirs and are popular with tourists who visit many handicraft shops or directly purchase them from factories. The pottery-making factories have now become a regular souvenir-hunting place for Japanese and foreign tourists who depart with Sarawak pottery to remind them of their delightful stay in Kuching. Siniawan is good to see at night but definitely better to feel during day time � the old wooden shophouses are good story tellers. The Sarawak Museum is acknowledge as one of the finest museum in Southeast Asia. Collections include superb ethnographic material, arts and crafts, natural history, and exhibitions of Sarawak's history and prehistory (including a reconstruction of the archaeological finds at Niah Caves) and of the oil industry in Sarawak. 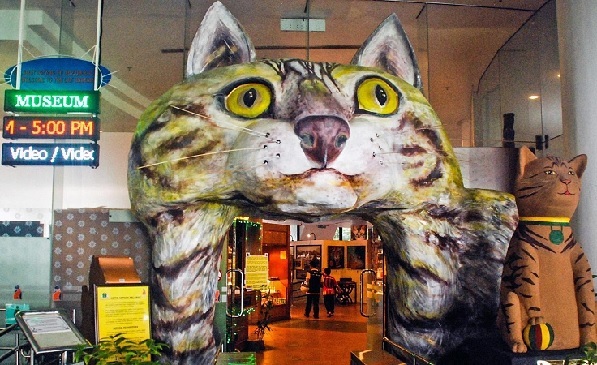 The Cat Museum is a reflection of Kuching's fascination with its own name (see Kuching section), and houses a collection of all kinds of feline memorabilia, along with displays detailing the evolution and natural history of the cat family, and the development of the different breeds of domestic cat. The Cat Museum is housed in Kuching North City Hall, across the river in Petra Jaya. Built in 1878, the fort commands a breathtaking and strategic position along the Sarawak river. Named after Ranee Margaret, Rajah Brooke's wife, it was completed the year after, just in time to defend Kuching against pirate attacks from the river. The fort has since been renovated and now serves as Police museum. The Police Museum traces the development of the police force in Sarawak and has an exhibition of weapons used during the Communist Insurgency. It also houses the famous "laughing skulls," which many witnesses claim have the ability to emit an eerie laughing noise.